I am proud to celebrate my website and blog’s six month anniversary! To commemorate this milestone, I have decided to feature guest blogger and fellow Detroit-based entrepreneur, Shenise N. Foote-Vann. Founder and Editor-in-Chief of YP Empire, Shenise N. Foote-Vann, has a sincere passion for the empowerment and enrichment of her community. Mrs. Foote-Vann earned her bachelor’s degree in Communication and Journalism graduating from the Honors College of Oakland University in Rochester, Michigan. There she researched, “The Effects of Hip Hop Culture on Black Women and the Black Culture.” Since, she’s written a plethora of cultural articles, led numerous discussions and workshops on Black America, and worked with several urban based community organizations. Mrs. Foote-Vann founded The AfrocentricX in 2016 as a means to educate, entertain, and empower Black America, more specifically, Black women. 2016 has unleashed a whirlwind of feelings, thoughts, and actions by the American people. It has arguably “awakened” or “uncovered” racism, misogyny, xenophobia, and homophobia. I’ve seen vandalism of the “N” word spray painted on homes and cars, discussed why Hillary was unqualified because she was a woman (yes someone said that), witnessed attacks against Muslims, and overheard slander toward gays and lesbians. This is the most hate I’ve witnessed in my nearly 30-year lifetime– besides what I’ve learned about in books, museums, and personal stories of the Jim Crow and Slavery eras. Being the non-violent, peace be with you, love everyone person that I am, it has been very difficult for me to process the hate-filled rhetoric in today’s society. But, like countless others, I have internalized my feelings as motivation. I AM MOTIVATED! I am screaming it to the mountaintops. As a double-edged minority (black woman), I am the target for much of the ridicule and hatred being spewed this year. But instead of folding, giving in and up like many want us to, I have decided to mobilize. I have decided to use my voice, albeit small or large, to take a stand. Thankfully, I am gainfully employed, happily married, college educated, and am like many urban born (and non-urban) black women that defy the box we’ve been placed into; thus, my newfound mission is to breakdown the dimensions of this box, build an empire, and showcase it to the world! So how am I doing this, you ask? Well first, I am wearing the armor of my ancestors. They fought for my basic civil liberties and though they may have lost the battle, we are winning the war. I am starting with me and who I am– I AM A PROUD BLACK WOMAN! I am learning more about myself and my culture and I am committed to empowering those who look like me and teaching those who don’t. Besides visiting and re-visiting museums, reading books, articles, and posts, I have decided to celebrate Black women. Now, more than ever, I feel like I am walking in my purpose. 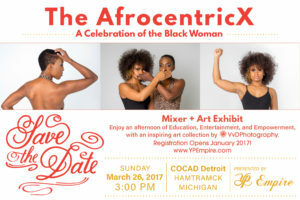 On March 26, 2017, I will host The AfrocentricX, an event dedicated to celebrating Black women. This Mixer and Art Exhibit is dedicated to educating, empowering, and entertaining those in attendance. It is inviting and inclusive! Will you join me in taking a stand for what’s right? Join us in March! For additional details, visit www.YPEmpire.com. We look forward to learning and growing with you! Feel free to tell me how you’re taking a stand and using your voice below- I hope to hear from you!